Almost 60 years ago now, Robert Triffin saw this coming. We live in a financial world of extreme myopia; wildly volatile stock prices see public corporations exalted as heroes or discarded like trash depending on earnings perceptions that cover a scant 90 days, a silly and arbitrarily short period of time. Boards and CEOs are forced to manage for short-term gain at the expense of long-term sustainability and growth. Each company a tiny microcosm of the intrinsically broken deal the US signed up for post-Bretton Woods. In 1960, Robert Triffin brilliantly argued that ever-accumulating trade deficits, the flaw of hosting the reserve currency and the result of Bretton Woods, may help economic growth in the short run but would kill it in the long run. Triffin’s theory, better known as Triffin’s Paradox, is essential to grasp the current economic woes and, more importantly, recognize why the path for future economic growth is far different from that envisioned in 1944. We believe the financial crisis of 2008 was likely an important warning that years of accumulating deficits and debts associated with maintaining the world’s reserve currency may finally be reaching their tipping point. Despite the last nine years of outsized fiscal spending and unprecedented monetary stimulus, economic growth is well below the pace of recoveries of years past. 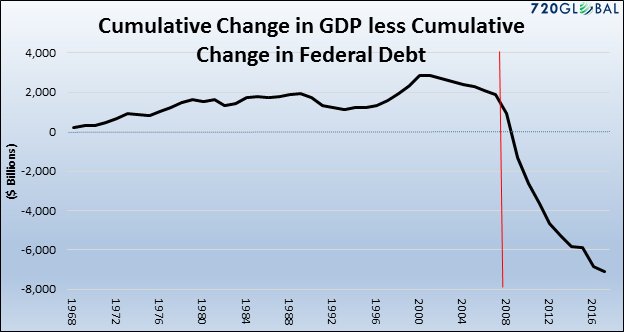 In fact, starting in 2009 the cumulative amount of new federal debt surpassed the cumulative amount of GDP growth going back to 1967. Said differently, if it were not for a significant and consistent federal deficit, GDP would have been negative every year since the 2008 financial crisis. How much longer can the United States manage this tall and growing task? What is the tolerance of foreign holders of U.S. dollars in the face of dollar devaluation? Is the post-financial crisis “calm” the result of a durable solution or a temporary façade? If in fact 2008 was a first tremor and signal of the end of this arrangement, then we are in the eye of the storm and future disruptions promise to be more significant and game-changing.